I adapted this recipe that I saw on the Nasoya website. This makes a very filling and delicious protein-rich drink that’s ready in minutes. Throw all the ingredients together in a blender and process until smooth. Chill and enjoy! Tofu by itself has very little flavor and is almost bland. 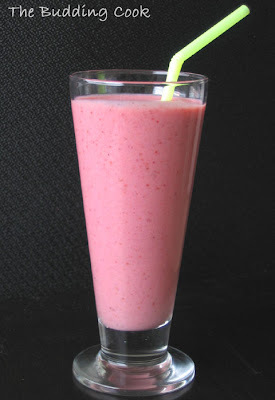 It blended really well (flavor- wise) with the fruits and took on the fruity taste. I was pleasantly surprised to find that it could not be tasted at all in the smoothie. What a great way to sneak some protein into your diet! This recipe goes to Rajitha for Weekend Breakfast Blogging with soy. I am also sending the picture to Bee and Jai of Jugalbandi for Click: Liquid. Wow..would have never thought of this..
Really innovatuve idea, TBC! The smoothei looks thick and creamy, yummy! Wow never thought of adding tofu to a milk shake... bet it tasted great! Nice entry for click and sounds like a healthy drink! your pic is beautiful as always. tofu!! excellent idea for a prtoein shake.. now why didn't i think of that!! Wow, this looks awesome T, love the colour and I bet I wouldn't know it has Tofu in it till someone told me!! wow this is something very different and something I have not come across any where... sounds very nutritious ..BTW how did it taste? Thanks for a very unique recipe. I've heard that tofu makes good dessets but I'm seeing for the first time. Looks so tempting and delicious. Thank U!! I am not a tofu fan and just cannot eat it, this seems so much better!!! Wow, that smoothie is so tempting tbc. Can I have that glass pls. wow! tofu smoothie :) good one! and that's a nice pic for click too! I love tofu in drinks. Lovely looking Click Entry, the tall glass and the background. Very Nice. I am still skeptical about trying the Tofu in India, i guess I should try it anyways. Thata good entry TBC ! from where did u get such novel ideas ? I love this pink color. Laavanya- me neither! The col is 'cos of the strawberries. it was a brilliant red first. Do try it. It is a protein rich drink and you could try giving it to A. You cannot taste the tofu- at all! Mallugirl- it tastes really like a berry smoothie...you would never know it had tofu in it! Namratha- thanks:-)... and that IS correct. If u do try it, give me some feedback, o.k? It is not my idea:-( I am not that creative. But I'm glad u like it. Never thought of preparing this with tofu! Nice idea, simply beautiful too.. I really should start doing some cooking with tofu and I have some in the fridge. I always use tofu in my smoothie. I like your recipe. Looks pretty good. Great idea! We sometimes make smoothies using soy protein powder but never thought to use tofu for some reason! I bet it has a much creamier consistency than the ones I've made before! I'll be trying this soon! Nicole- if you like regular smoothies, you'll certainly like this one 'cos you can't taste the tofu at all! hey this is so refreshing!! loved it.. nice pictures you have and a huge collection of recipes..
and by the way thanks! any time you're using tofu for a fruit drink, it REALLY helps to add a generous squeeze of fresh lemon or lime...overcomes the total beany blandness of the tofu.